For a few weeks, Xiaomi’s Pinecone processor in the news and there was information that this new processor will be introduced with Xiaomi Mi5C. Today, we have got an exclusive information that the Mi5C is going to feature the Snapdragon 821 chipset and not Pinecone. Previous rumors suggested that the octa-core Pinecone processor is a little bit powerful than the Snapdragon 625 & Mi5C will be the first phone to feature this new chip. 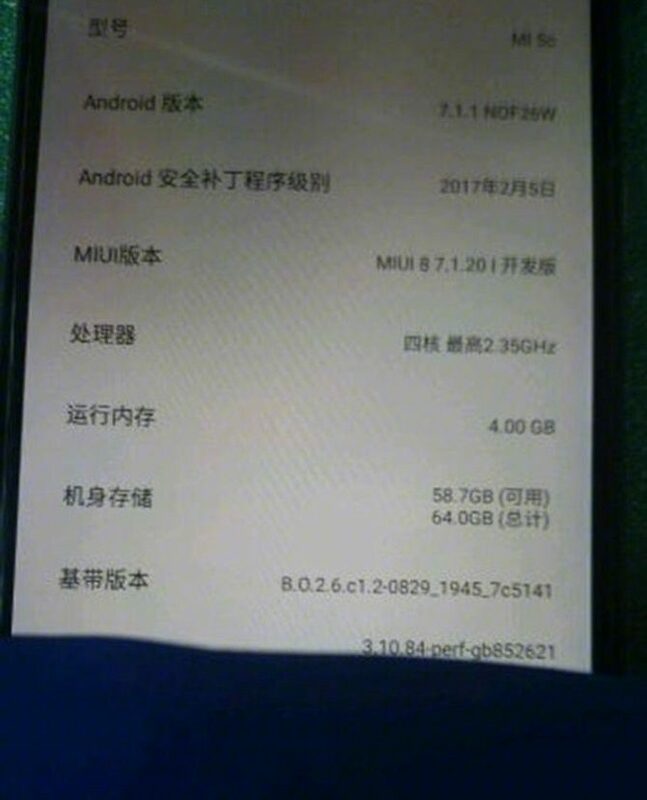 Today, a new image of the ‘About Phone’ setting of the Mi5C has been spotted that show some of the specifications of the device. The Xiaomi Mi5C is going to feature Android Nougat 7.1.1 out of the box along with 4GB of RAM and 64GB internal storage. It is not directly mentioned that there will be Snapdragon 821 but because the image shows a Quad-Core processor with 2.35GHz clock speed. In fact, these are the specs of Snapdragon 821. It is expected that two different variants for Xiaomi Mi5C are coming, i.e., 3GB and 4GB RAM options. The chances are that Xiaomi might use the Pinecone chip on the 3GB RAM variant, but there is no information regarding this at the moment. Stay Tuned because we will keep you updated.